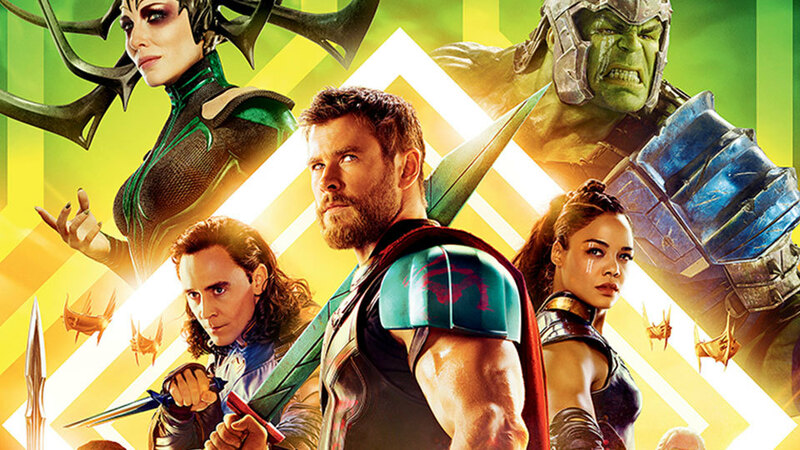 “Thor Ragnarok” is perhaps the funniest movie ever made about stopping an impending apocalypse. Its consistently entertaining humor is on par with that of “This Is The End,” the 2013 movie in which Seth Rogan, James Franco, and their pals try to survive Armageddon while mocking their own personalities. I’d give another example, but there aren’t many movies that try to turn the end of the world (or, in this case, the end of a world) into a source of laughter. There’s a specific reason for that, one that “Ragnarok” either doesn’t know or chooses to ignore. The apocalypse is not an inherently funny subject. Indeed, it’s the opposite—it’s a subject that plays on our worst fears and nightmares, in which everything we know and love hangs in the balance and could be destroyed in an instant. “This is End” got around that problem by treating everything, especially its stars, as totally ridiculous and silly. “Ragnarok,” on the other hand, wants to have it both ways: it wants you to laugh out loud and then, moments later, be stunned into silence by the destruction of an entire civilization. It wants us to enjoy the hilarious sight of Jeff Goldblum DJing immediately before he executes a prisoner of his character’s brutal regime. For what it’s worth, “Ragnarok” is mostly a great movie, with a stellar cast, vibrant and creative visuals, and yes, a great sense of humor. But, in trying to tell a story that is both very silly and very serious, director Taika Waititi and his screenwriters (Eric Pearson, Craig Kyle, and Christopher Yost) create a movie without a coherent sense of what it actually is. Some two years after “Avengers: Age of Ultron” saw Thor search for more “infinity stones” (one of the many plot devices that tie the Marvel movies together), “Ragnorak” picks up with the titular hero imprisoned by the fire demon Surtur, who claims that he will soon fulfill a prophecy to destroy Asgard (Thor’s homeworld). Shortly afterward, Hela (Cate Blanchett) reappears after years of imprisonment and sends both Thor and his villainous brother Loki to the planet Sakaar. Faced with the impending demise of his homeworld, Hulk must recruit Loki, the previously missing-in-action Hulk (Mark Ruffalo), and newcomer Valkyrie (Tessa Thompson) to stop Hela from destroying Asgard. (It’s worth noting that, if you haven’t seen many of the other Marvel movies, you will likely be very, very lost here). Let’s start with the pros. “Ragnorak” has a fantastic cast with solid comedic chops, especially considering much of the film’s dialogue is improvised. Hemsworth and Hiddleston are better than ever, with their lengthy experiences as Thor and Loki giving them a deep understanding of who their characters really are. Ruffalo is similarly fantastic, switching between his goofy scenes as the Hulk and his more grounded, serious moments as his alter ego Bruce Banner. The new members of Marvel’s franchise are similarly fantastic. Blanchett is absolutely stunning as Hela, with a focused, psychotic intensity that makes her character more compelling than she has any right to be (Hela is hardly a compellingly written character; nearly every move she makes is a poorly recycled cliché). Franchise newcomer Tessa Thompson is terrific as Valkyrie, a figure with a tragic past and a reluctance to return to battle. And, in what can only be described as a casting coup, Jeff Goldblum portrays the villainous Grandmaster, the brutal tyrant of Sakaar with the charms of, well, Jeff Goldblum. “Ragnorak” is also one of Marvel’s most visually stunning films yet. With a mix of towering skyscrapers and literal mountains of trash, Sakaar acts as a great opportunity for Marvel to show off its creative skills, with a varied mix of colorful and eccentric costume design and depressing, literal mountains of trash that fill the planet (it’s a far more interesting setting than Asgard, the boring, lifeless, and uninspired kingdom that the film begrudgingly returns to). Waititi’s fight scenes are peppered with dazzling and wonderfully eccentric special effects, inspired by colorful ’80s pop-art. It’s a film that’s as thrilling to look at as it is fun to laugh at. But, in spite of all that “Ragnorak” does right, it never coheres as a film, suffering from tonal whiplash throughout. Take an early scene involving Doctor Strange (Benedict Cumberbatch, another member of the Marvel Cinematic Universe) as an example: the Strange and Thor enjoy a few laughs and share some exposition. Suddenly, and awkwardly, we’re thrust into a tragic death scene, immediately followed by Hela’s unnerving first appearance. We’re never really given a moment to breathe between these story beats. It’s hard not to think that Waititi simply wasn’t interested in his film’s drama, but had to include it due to the nature of the story. “The end of Asgard” doesn’t exactly have a fun ring to it, and it seems Waititi would rather have ignored this plot point altogether, in favor of spending more time on a distant planet, having fun with his actors improvise. It’s a movie with two identities: one of a hilarious ensemble comedy, the other a story of civilizational collapse and its discontents. It’s a movie with a climactic battle that has both fireworks to celebrate a victory in battle, and an uncomfortably included refugee crisis. “Thor” isn’t exactly the best character to adapt to the silver screen. He’s a serious, stoic figure, caught up in family dramas that could provide inspiration for some genuinely great films. If studios and filmmakers were serious about crafting a profound drama, they could probably make a good drama about Thor. But I don’t really think anyone believes Marvel made “Ragnorak” for “artistic” reasons. As such, drama has always been the weakness of the “Thor” films. The first one wanted to be a pseudo-Shakespearean drama (it was, after all, directed by the great Shakespearean actor, Kenneth Branaugh), but there was never any dramatic weight. The second film, “Thor: The Dark World,” was simply lazy in its dramatic execution, barely evening trying to make the audience shed a tear at the death of Thor’s mother. Waititi very clearly knows about the weaknesses of the “Thor” franchise. He’s a smart director, and he may have been right to focus on comedy over drama. The best parts of the first “Thor” were watching Hemsworth as a classic fish-out-of-water, a literal God trying to understand humanity with hilarious results. “Ragnorak,” then, is the first “Thor” film to put Hemsworth’s natural comedic talents to good, even great use. If only that pesky apocalypse didn’t get in the way of all the fun.